Ninety-six chapters are included in this volume. Embryology and physiology of the facial nerve, inner ear, airway, and head are discussed in detail, along with evaluation of hearing, speech, and language in children. Specific disorders that are covered include otitis media, cholesteatoma, rhino sinusitis, nasal malformations and tumors, laryngeal and tracheal anomalies, head and neck malignancies, and many more. Separate sections included discuss about pediatric sleep medicine, the pediatric voice, and pediatric velopharyngeal insufficiency. 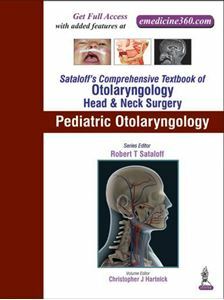 This volume is a thorough guide geared towards practicing otolaryngologists and otolaryngology residents. Chapters 22, 31, 50, 61, 84, 86, 87, 90, 91 and 93 contain video(s).